Makeig S, Delorme A, Westerfield M, Townsend J, Courchense E, Sejnowski T, Electroencephalographic brain dynamics following visual targets requiring manual responses. 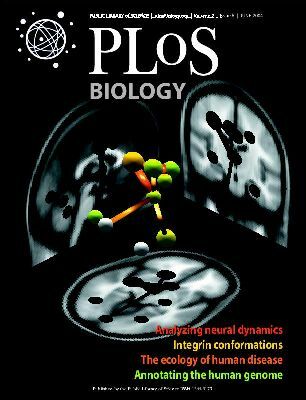 PLOS Biology, 2004. Click on (blue) paper title above to view, print, or download article. Figure 13. Post-motor theta dynamics. Frame of an animation representing grand mean patterns of event-related dynamics in the theta band. Black traces in the lower panel show the envelope of the grand mean ERP time locked to the subject button press; (dotted vertical line) median time of stimulus onset (response-352 ms). Theta dynamics computed in a window (center frequency 4.87 Hz, 3-cycle Hanning taper) centered (blue vertical line) 89 ms after the button press (red vertical line). Each sphere in the upper panel represents the location of the equivalent dipole for a component cluster. Approximate projections of the equivalent-dipole locations are shown in shadow on three planes from an average MR image (Montreal Neurological Institute). Log spectral power changes (relative to pre-stimulus baseline) are indicated by the sizes of the spheres (see key, bottom right). Non-grey sphere colors indicate consistent inter-trial phase locking (ITC). Colored cylinders joining spheres indicate significant event-related phase coherence (ERC) between cluster components. (For movie method, see Delorme, Makeig, Fabre-Thorpe and Sejnowski (2002)).